When the time came for this nation-wide baking operation to expand its production of muffins by building a new manufacturing plant, company managers decided to head in a new direction. All of the company's other manufacturing facilities rely heavily on sizable workforces to shepherd products from the raw material stage all the way through production, packaging, and distribution. While this labor-intensive approach gets the job done successfully at the company's plants in the U.S., Mexico, and the U.K., building a new facility gave managers the opportunity to test out new, fully automated equipment and systems. The company's decision to erect a new facility in Columbia, S.C., to produce muffins for distribution throughout the Southeast created a test-bed for the latest in new technologies. "We really started our planning process with a nearly blank sheet," explains Jerry C. "We wanted to look at each discrete step in the manufacturing and material handling processes, and figure out how it could be fully automated in order to improve the overall efficiency of the operation and lower the cost of operation." The flow of product through the Columbia plant starts with a three-line automated case-forming operation. One of the lines makes cases that are designed to hold three-cell trays of muffins. A second line produces cases that will hold single muffins. The third line assembles open-faced trays that each contain 12 individual muffins. Empty cases and trays are assembled and their bottoms sealed; they are then fed onto three take-away roller conveyors which merge into a single belt conveyor line. As the cases and trays travel along, they pass through a sortation section that feeds them onto three parallel roller conveyors. From this point, the empty cases are conveyed approximately 100 ft. through the plant at floor level. As the cases and trays enter production, their flaps are automatically opened and FANUC robotic loaders fill them with finished products. 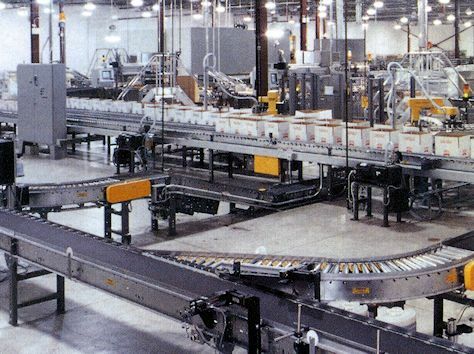 Filled cases and trays traveling on the three conveyor lines are eventually merged onto a single belt conveyor for accumulation and transport to the packaging area. This conveyor feeds the products to a divert point at which they are directed either to shrink-wrapping or to case closing. Products diverted to shrink-wrapping (12-count trays) are wrapped and then automatically loaded into shipping cartons. Cases that do not require shrink-wrapping pass through a carton closing station where their tops are glued shut. The two conveyorized packaging lines join again at a 2:1 merge section. From this point, the cartons travel up an incline conveyor and across a ninety-foot section of the plant. They then head down a decline conveyor to return to floor level, and proceed on to palletizing. After examining the alternatives, members of the project team chose to use a fully automated palletizing operation. The plant is presently using three palletizing lines, but plans call for increasing that number to six lines in the near future. As filled and sealed shipping cartons approach a FANUC palletizing cell, they are diverted onto three feed-lines and then into the cell. (A single pallet dispenser automatically supplies the three stations.) Loaded pallets are automatically shuttled onto a short length of roller conveyor, and conveyed to a transfer point. All products are then transferred laterally into an air-lock that separates the production area from the freezer. Pallets of cartons move onto a drag-chain conveyor in the freezer where lift trucks will pick them up and place them onto flow-through racking. Jerry C has discovered that full automation generates some impressive benefits: when compared to the company's other plants, the new Columbia facility is producing nearly twice as much product in about half as much time. "What we've learned from this experience is that this kind of a production operation can benefit tremendously from full automation," he says. FloStor had the technical expertise to get these systems up debugged and into production right on schedule. Working with the right integrator is crucially important.